I thought this book would be similar to Beaded Jewelry with Found Objects. It is, sort of, but instead of a playful sort of style, this book shows you how to produce artificially aged stuff using a lot of copper, old pages, and fabric. The design types are just one step from steampunk. Instead of relying on the simple stringing and wirebending techniques, soldering plays a heavy role in the designs within. So you know what you’re looking for. I’m not sure the book served me well since that isn’t the sort of design elements I like or use (although I do have two soldering irons). But it’s all grist for the mill, I suppose. What is this, 2004 and I’m doing quizzes I find on Ravenwood’s Universe? That’s far more hippie than Ravenwood, so he must best me in combat now. The funding issues are also causing the city to begin looking “outside the box” for future solutions, which could include the Ozarks Regional YMCA, Childers said. The nonprofit group has been invited to the Aug. 9 meeting. Ozarks Regional YMCA CEO Brad Toft said the group wanted to discuss with the aldermen a possible partnership between it and the city to manage the community center or the entire parks system, if the city’s interested. And though it wouldn’t help with the city’s impending problem with balancing the center’s 2010 budget, it could help with future budgets. I recommended that for the city of St. Louis on July 12. Do you know the best way to get our superiors in Washington, D.C., and New York to back a fence on the Mexican border? Tell them it is there to keep American guns out of Mexico. We need to keep each and every gun, both of them, that would cross the border into Mexico in the good old USA. I recently realized that when I set up the blog, it failed to import the first two months of the old Blogspot blog. In correcting it, I’ve re-imported the whole kit and kaboodle again, resulting in double posts for the years 2003-2009. I’ll get around to fixing that soon. Most of you live in the present, though, and won’t see a difference. Those of you who are my friends on Facebook know I’ve started baking and doing handcrafts and already suspect my masculinity. Now, you encounter a review of a book based on a television series based designed for little old ladies with cats. Well, in my defense, I would probably not have bought this book for myself even given my propensity for books based on television series and films. However, I bought a couple of these books at a garage sale or book sale quite some time ago to give to my sainted mother since I thought she wasn’t reading enough and she might read it. I don’t even know if she did or not, but now the book has passed to me. And I read it. It’s about 250 pages in paperback; I think it’s a paperback original. Its pacing isn’t what I usually read. It’s not choppy or punchy. The first person voice of Jessica Fletcher spends a lot of time talking about side issues, musing on Key Lime Pies and the relationships of those around her. Two cases in point: The book spends 5 pages on Fletcher’s ride from the mainland of Florida to Key West for a weekend even though it’s mostly discussing key lime pies and the changes of scenery. Later, she spends a long paragraph hoping that a recurring character has a good relationship with an old friend even though these are not germane to the plot. Maybe that’s how women think, or maybe that’s how Bain thinks women think. Don’t get me wrong, I’ve been knocked early and often for my fallacious depiction of fictional women. But the pacing dawdles until about 50 pages remain, and then we get to the sleuthing. The story: Jessica’s retiree friend in Florida dies, and it might be murder. Jessica comes down and ends up investigating 100 or so pages later when they think it is murder. Was it the husband? Was it the businessman? Who are you kidding? It was the businessman. About 200 pages in, the pace starts up, and with 25 page to go, the first person narrator asks a question of a witness/involved person and doesn’t tell the audience what it is so she can point at the businessman and his lackeys dramatically. The main verbal trap relies on a klew obscured by 240 other pages of fluff and extraneous conversations among colorful but sort of extraneous characters. But Bain’s a professional. He hit his word count and provided something that the target audience appreciates. I guess this is the 21st book in the series or something, eight years after the series went off the air. The series is actually ongoing to this day. As a writer, he’s doing something right. However, this is not the sort of thing I dig. And, sadly, I’ve got at least one more and maybe more to go. Curse my giving nature. Interesting factoid: apparently, there are two series of novels based on the series. One is Jessica Fletcher’s novels and the other is Jessica Fletcher’s adventures in real life. Way to keep it going, fellows. FBI Director Robert Mueller told Congress on Wednesday that the bureau’s domestic surveillance guidelines are being used properly and that agents are not employing them to target people for investigation based on race. The FBI director’s defense of the guidelines at a Senate Judiciary Committee hearing followed criticism by civil liberties groups that the guidelines unfairly target innocent Muslims. The guidelines “do not target based on race,” Mueller said. So is it the press or the legislature in this case that is the blockhead who thinks a religious choice is a race? False dilemma. It could be both. I don’t know why conservatives aren’t still in an uproar about the Americans with Disabilities Act and its magical ability for the court to discover new disabilities and new ways that the world should be changed to accommodate smaller and smaller numbers of people. Case in point: Counters at Chipotle restaurants are too high for people in wheelchairs to see over, which is a civil rights affront akin to not letting disabled people worship, vote, or (in Finland) have a broadband computer connection. That’s going to apply to Subways, too, you know, and it might well apply to any restaurant like Zio’s here in Springfield, the Elephant Bar in St. Louis, or the Macaroni Grill chain that has a small wall dividing the kitchen from the dining area. As a result, of course, they will simply put in a full wall and stop preparing the food in the open. The disabled won’t get to see it anyway, nor will anyone else. This is the Harrison Bergeron world of the ADA. Somehow, bad ideas passed into law become untouchable after a certain amount of time. A statute of limitations makes them unopposable, or some sort of legislative stare decisis sets in and you can’t cure a case of it with antibiotics. Sometimes, the trigger of veneration is just the president’s signature, depending upon the party of the President and the sweeping nature of the power grab. People who oppose them or dare, dare to ask for some sort of proof that the ideas work or solve the problem, much less ask if those laws are a legitimate or moral function of government get labeled as wingnuts or extremists by right-thinking people in politics, government, and the press. Republicans and conservatives running for office should not shy away from questioning these laws, whether the purposefully nebulous ADA, a ban on incandescent light bulbs, centralization of education into a Federal Department, or Obamacare. The press and the ruling class might well pillory conservative candidates for this stance–a rational, open mind–now, but a growing portion of the electorate is becoming amenable to considering it if candidates can provide reasoned arguments for dismantling the existing structure of the bloated government. Too many people think the Republicans don’t want to do that, but you know what you call politicians and candidates who lay out reasoned paths, convince constituents of their values, and then carry them out? Leaders. Unironically and without quotation marks. De Soto police fished a 2-foot alligator out of a creek there Sunday evening, an alligator that’s now making its home at the World Bird Sanctuary. Someone spotted the animal in Joachim Creek about 6 p.m. Sunday and called police, said Chief Ernie Paul. Two officers snared it with a catchpole, and kept it overnight in a makeshift pool in an unused city building. I bet that building was safe for the night. The title is a joke alluding to a children’s book, Frederick’s Alligator . Yesterday, I went to the dentist to have a cavity filled and a crown replaced. I haven’t gone under the drill in a little over 9 years. About that time, I got caught up with all the work I’d lacked in my 20s, so I had cavities filled, roots drilled, and crowns attached. It wasn’t a bad visit as far as it goes. I was a bit apprehensive, just a tad. Back in the olden days, the aforementioned series of trips a decade ago, I was in the dentist chair every month for a couple hours, so I got used to it. This time, my apprehensiveness melted pretty quickly. I even quipped to the doctor as his drill smoked cutting through porcelain and tooth material that it reminded me that I had an etching bit for my rotary tool that I haven’t tried out yet. I said I was going to go home and try it on a random ceramic tile. He laughed so hard he pierced my cheek for me. Well, not quite. I’m not that funny, although with only half a mouth working, I sure sounded funny. But the most interesting part of the visit was getting the new crown. In the olden days of 2002, the doctor took an impression of the crown to replace and shipped it off to a lab for milling. I got a temporary cap and, three weeks later, I came back to have the cap cemented on with the special UV penlight. Fewer than 10 years later, the dentist wheeled in a computer on a cart with some elaborate CAD software on it. He stuck a funny camera in my mouth and snapped a couple digital images. The software plotted my ha’tooth next to the adjacent teeth, and the doctor moused some lines in. He compared the shape of the tooth he was fixing to the bite pattern and smoothed some where the tooth would impact the top tooth. Then he sent it wirelessly to the tooth printer. It’s not really a printer, but close enough. In a little cubby at the back of the office, he has a computer-assisted milling machine. You plug in a block of ceramic, and two diamond-tipped drill bits carve the crown out of it in about 7 minutes. During the process, one of the bits became dull, so the technician opened the machine and swapped it out just like she was changing the toner. A couple minutes later, the tooth dropped from the remainder of the block, and after some cleanup and firing, they affixed it into my mouth. In 10 years, we’ve gone from precision lab millwork to an in-office computer peripheral. Frankly, I am amazed and pleased. And sad that the pace of change is probably going to change once the commissars handle medicine and dentistry for us poor little helpless children in the citizenry. Actually, everything coming out of this Congress could be summarized as Title+Concept+Unintended Consequences. The Young and Jobless: New evidence that the minimum wage has hurt teenage workers. The wage hikes were implemented in three stages between 2007 and 2009, and not all states were affected because some already mandated a minimum wage above the federal requirement. But for the 19 states affected by all three stages of the federal wage increase, “there was a 6.9% decline in employment for teens aged 16 to 19,” write the authors. And for those who had not completed high school, “we estimated that the hikes reduced employment by 12.4%,” which translates to about 98,000 fewer teens in the work force. You know, one would start to think the government doesn’t know what it is doing. But those who have religious faith in its benevolence and efficacy won’t be swayed from their fervor by mere evidence. Of course, I’m enough of a fanboy of Objectivism to think that speech was cool and prefer Gary Cooper over Gregory Peck. It was the best performance of Peck I’ve seen so far, but that just meant that it was a performance where I didn’t think the main character was a complete wuss. Confession, gentle readers. I bought this book on impulse at the grocery store for nearly full price on Thursday after I watched a Jeff Foxworthy videocassette on Wednesday night. It seemed like kismet. So when I had some time to while away at an airport on Thursday, I brought this book and read it in a little over an hour. I thought the book would be some amalgamation of Lay Low and Don’t Make The Big Mistake, a book I read apparently before I began keeping reviews or a book whose review disappeared into the aether like Martian Knightlife, The Complete Geek (An Owners Manual, some Scott Adams, and a touch of You Might Be A Redneck If….. However, it’s distinctly the latter. Amusing, but no real laugh out loud moments. Foxworthy and co. apparently continue the “How to Really Stink” series by identifying ways to get hired and to underachieve at work. It recycles at least one gag from the video of almost 20 years earlier (20 years of Jeff Foxworthy? Hey, his little girls must be in or out of college by now). Better than Lay Low… and The Complete Geek, anyway. U.S. House Democrats criticized airlines Wednesday for increasingly charging for checked baggage, seat selection and other services, and indicated they are considering legislation to tax the revenue collected from the fees. Airlines are increasingly relying on ticket surcharges to offset spikes in fuel prices and overcome weak demand. Airlines collected $1.3 billion from fees for checked baggage and reservation changes in the first three months of this year, a 13% increase over the same period in 2009, government data show. House Transportation Committee Chairman James Oberstar (D., Minn.) called the fees a “backdoor price increase” in airfares, with consumers now paying for many items that until three years ago were included in the price of a ticket. He and Rep. Jerry Costello (D., Ill.) held the hearing to determine whether legislation should be proposed to rein in the fees and ensure the government gets a cut of the revenue. Currently the government collects a 7.5% excise tax on passenger fares but not on ancillary fees. Applying the excise tax to baggage fees, which provided about $2.5 billion in revenue for airlines last year, would have led to an additional $186 million in federal excise taxes, congressional investigators said. Remember, when Congress says it’s looking out for you, it’s because Congress thinks you’re an easy mark. Here is the review of Martian Knightlife that somehow didn’t make it onto the site last August. The more I read of James P. Hogan, the more I like him. That’s saying quite a bit considering that I liked him a lot when I first read him 25 years ago. This book is a ripping adventure taking place on Mars. A Saint-like character (come on, in 2001, you’re selling a character as like The Saint? Really? How many science fiction readers in 2001 also read Leslie Charteris books from the 1930s and 1940s?) arrives on Mars and has two intertwined adventures. In the first, he investigates the case of a scientist, the first teleported, and why his bank accounts are cleaned out. Secondly, he helps some archeologists defend a significant dig from a mining corporation that has rights to the land. As I mentioned, the plotting moves quickly (more so than The Legend That Was Earth), and Hogan drops good tidbits of libertarian philosophy while tackling some weighty questions of identity. Sometime last year, I got it into my head that I should write a letter to James P. Hogan. Probably in August, when I read Martian Knightlife (whose review I cannot find on the site here, so I’ll put that up presently). I didn’t get around to it, and now I’m too late. James P. Hogan, author of Inherit The Stars and 30 other hard science fiction novels, passed away yesterday [July 12 — bjn]. You know what would make a realistic plot these days for a heist movie? Industrial warehouse theft, where the bad guys back trucks up to the dock and make off with nonglittery stuff from the warehouse. Thieves staged a Hollywood-style heist at a pharmaceutical warehouse over the weekend and made off with about $70 million in antidepressants and other prescription drugs, authorities said Tuesday. Thieves cut a hole in the ceiling of an Eli Lilly and Co. warehouse in Enfield, a northern Connecticut city that borders Massachusetts, before dawn Sunday and rappelled inside, where they disabled an alarm and apparently loaded pallets of drugs into a waiting vehicle, police said. The thieves made off with enough drugs to fill at least one tractor-trailer, police said. Thieves swiped hundreds of tons of nickel and copper from a Liverpool warehouse in May, the latest in a rash of commodities heists spurred by high prices. The heist was the second in less than a year from a U.K. warehouse owned by Henry Bath. Last September, 209 tons of aluminum ingots valued at £360,000, or about $545,900, were stolen from a Henry Bath facility in Liverpool. Police estimated that it would have taken up to eight trucks to remove that amount of aluminum. Jumping jiminy, those are plots that are not overused. I picked this book up because I thought it was a crafting book designed around using junk for other purposes, kinda like Trash to Treasure or something. Instead, it’s an interior design book that focuses on building your rooms with pieces of junk that you find in antique stores and rummage sales, sometimes combining (juxtaposing) disparate things for a new function. Like an old skateboard for a paper towel holder. Most of the stuff is not refurbished, refinished, or improved; instead, it’s put to some other use. Well, not all things are left untinkered with, and not all things are junk. One perfect sign that capped the room was a little weathered, wood-routed sign that cost $15 at the antique store. For an accent piece that most will overlook. That’s not junk. Some of the improvements involve glass tabletops special ordered. That’s not inexpensive. So there’s not any crafty stuff in here, but I did browse for some ideas that probably have been put on simmer for my own use later. I have to say, though, that I did not care for the design herein. I’ve been a bachelor, so I’ve retasked some things, and no readers on this blog but my wife remember the red velvet covered industrial cable spool that served as a table, night stand, or entertainment center between the years 1994 and 2000 in my house. One can accept weathered, rusted, and otherwise ticky tack elements to a room or a whole room (or in this book, outdoor spaces) if one accumulates the pieces over time and doesn’t tend to them because, well, your grandparents or great aunts or whomever is getting older. But to freshly design things with this look is an abomination. In my aesthetic ca 2010. In a couple years, my backyard will no doubt be a combination of newer but used pieces with things I buy at yard sales to fill a niche. But it will be out of cheapness and necessity, not because I designed it to look that way. Springfield, Missouri, recently put up a set of wayfinder signs. What are wayfinder signs, you ask? Expensive. 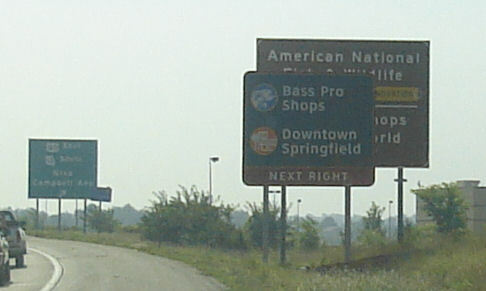 Springfield spent $700,000 out of its capital improvement budget to put up signs with helpful arrows to Downtown, the Battlefield Retail District, Bass Pro Shops, and so on. Granted, I can understand why you might need a sign to indicate downtown, since there are few buildings over four stories tall in Springfield and a visitor might not realize that this cluster of short buildings is downtown. But does it really need signs indicating the Battlefield Retail district? You’re on Battlefield Road and there are shops. I suppose if there are tourists who cannot figure that out, we do need to point them to the right places to part them from their money. And Bass Pro Shops? If you’re someone who’s going to Bass Pro Shops, you’re someone who knows where it is. No, the wayfinding signs are just a pretty way to spend money and to bow to peer pressure of other cities that have wasted money putting these things up. I can’t be the only one to notice that candidates for office often stress that they’ve lived in an area all their lives and know the solutions the region needs, and then they go on a junket–I mean fact-finding mission or conference trip–to some fabulous location and come back with a bunch of imported ways to spend money to make this city look like that city. Me, I just moved from a small municipality (Webster Groves) in the St. Louis area that put up its own wayfinding signs in the last two years so people could find the various districts within its 5.9 square miles, so I’m particularly stricken by them. In an era of GPS, people need these things less and less, and municipalities are going for them more and more. A city that finds almost a million dollars (close enough for me) to put up these signs cries poverty for its capital improvement budget enough to extend a tax for its projects. 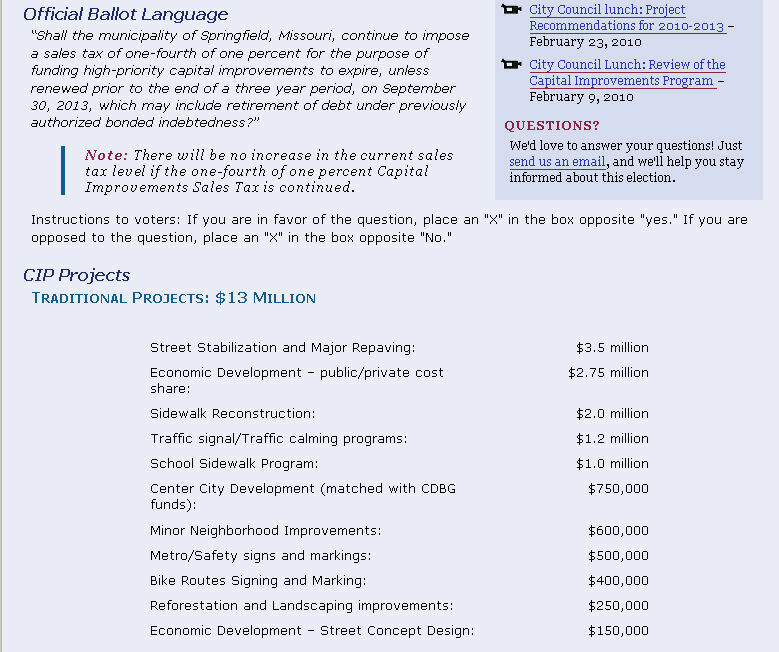 Here’s a screenshot from the Springfield city government site listing those programs, many of which could have been paid for with this $700,000. This sign, appearing on Eastbound 60/160 (The James River Freeway) just before the Campbell exit, stands less than 20 feet in front of a MoDOT sign that says pretty much the same thing and obscures the larger, already paid for, sign’s view. President William McKinley purchased a Zeglen vest, but sadly the order did not arrive in time to prevent his assassination. Following the killing, Teddy Roosevelt bought a waistcoat made of the magical material. Even Archduke Franz Ferdinand purchased a jacket, which he wore on the day of his murder (the bullets struck his neck). What if Teddy Kennedy never became President? What if World War I was not triggered until 1922? I’m not an alt-history writer. I’ll leave it to you guys to speculate. Sorry, no link to the article, but History Magazine isn’t Web friendly. Buy a copy and keep them solvent until such time as I overcome my laziness and send them another history piece.